In telling his story, “Anti-Rightist” Campaign survivor Zhang Xianchi fittingly quotes Georg Büchner’s famous line from Danton’s Death: “Revolution is like Saturn, it devours its own children.” Further passages from the German play would also resonate with Zhang’s oral history, such as: “The sin is in our thoughts” and “Your words smell of corpses.” The dramatic references would be appropriate, considering the expressionistic theatricality of Qiu Jiongjiong’s boldly experimental hybrid-documentary Mr. Zhang Believes (trailer here), which screens during the 2015 Vancouver International Film Festival. Qiu will indeed talk to Zhang and his remaining “Rightist”-denounced colleagues, but even these sequences have a bit of visual kick to them. However, must of the film dramatizes his story in highly stylized stage sets and sound stages, much like an old school Maoist propaganda pageant or a Brecht production before that. This is itself is a rather bold strategy, using the Party’s own techniques to criticize it. Yet, there is no shortage of substance underpinning the style. Zhang spent years in Maoist-era work camps, but most of the film is devoted to explaining how he got there. Although Zhang’s father was a low level KMT official, he had once been a Communist and it is he who first radicalizes his son out of some misplaced nostalgia that he probably regretted. Still, it is because of his demonstrable record of revolutionary subversion and blinding zeal that Zhang is initially accepted into the PLA. Time and again, Zhang witnesses Party hypocrisy during his military service, but he resolutely clings to his illusions. However, it becomes even harder to kid himself when he and his new wife Hu Jun and their families struggle to survive due to their “class enemy” heritage. Unfortunately, all their remaining self-delusions will be crushed during the Anti-Rightist Campaign. Using Zhang’s testimony, Qiu clearly establishes the deceptive nature of the “Thousand Flowers” Campaign, inviting criticism from progressive true believers like Zhang and Hu Jun, so that it could subsequently label them “Rightists” and purge them accordingly. Of course, that only left sycophants and psychopaths in positions of power, exactly as the Party wanted. Yet, Zhang slyly observes his most enthusiastic tormentors had even worse done unto them during the Cultural Revolution. Cue Danton. 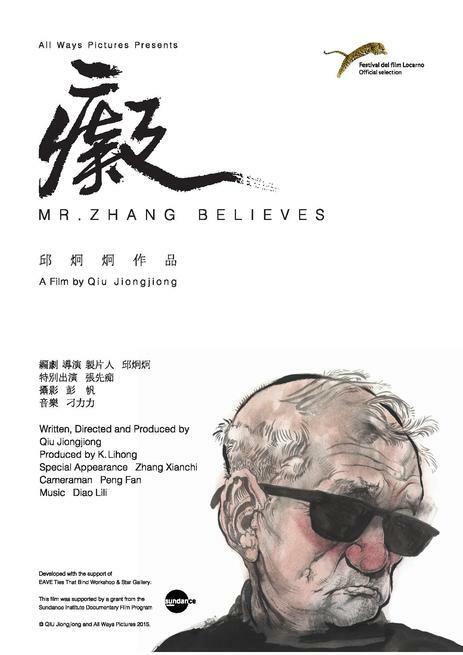 Mr. Zhang Believes defies just about every manifestation of authority imaginable, including the political, ideological, and aesthetic. However, it is not experimental for the sake of experimentalism. As an accomplished painter, Qiu has a strong sense of composition. With cinematographer Peng Fan he creates some staggering black-and-white imagery. Frankly, there is not a thrown-away second of the film. Each frame is artfully arranged and suitable for framing, even though they often depict great tragedy. There are also real performances unfolding on-screen. Jimmy Zhang plays Zhang Xianchi as a guileless but credible everyman, often too studious for his own good, while Ma Xiao’ou is acutely haunting as the ill-fated Hu Jun. Arguably though, one of Qiu’s most effective decisions is his use of Zhang’s young adoring sister Ba Mei (whom he and Hu Jun temporarily adopt for his mother’s sake) as the innocent witness. Engagingly played by Cai Yifan, she metaphorically serves as the Shakespearean character who survives to tell the tale. Mr. Zhang Believes is an avant-garde film in many respects, but it packs more emotional punch than most shamelessly manipulative melodramas. Somehow Qiu pulls it off. He draws viewers in and Zhang’s testimony lays them out. Indeed, the irony and finality of his closing words are simply devastating. It is a rare example of a documentary (liberally defined) that is truly a work of art. Very highly recommended for anyone interested in Twentieth Century Chinese history, Mr. Zhang Believes screens this Wednesday (9/30) and next Monday (10/5) as part of this year’s VIFF.